Germany’s dominant and influential automotive magazine Auto Motor und Sport initiated long term reliability tests way back in 1962, when it subjected a VW to a 15,000 km test. This was at a time when pretty much no one was subjecting cars to extended real-life evaluations, certainly in Europe. The length of the long term test kept increasing; in 1965 a NSU Prinz survived the first 50,000 km test, and a 1974 VW 1302 did quite well (for the times) in the first 100,000 km (61,000 miles) test. The worst ever was a 1978 Citroen CX 2400 that spent 65 days in the shop. AMS subjects numerous cars per year to the 100k test, and no car had ever aced it (zero defects). That is, until now, when the Toyota Auris Hybrid (Corolla-based with Prius drive train) finished its two-year regime without any defects (beyond normal wear items). Well, technically, a light bulb burned out at 98,805 km, but that still gives it the best results ever, and AMS‘ title of “Null Fehler“. I’m surprised a Toyota, hybrid or otherwise, didn’t take this title sooner. Toyota’s hybrid system is mature, with millions of units over 15 years in Japan, 13 years in the US. It started out amazingly reliable, landing at the top of Consumer Reports’ most reliable cars list several years running. Hybrid cars simply have fewer moving parts. The engine is now pared down to its essentials, with no belts, no distributor, no mechanical takeoffs of any kind. It doesn’t run all the time, and it’s spun up to a higher rpm with full oil pressure before gas and spark are applied. No complex mechanical transmission, just a single planetary gearset. No power steering fluid. It does have a second cooling system for the electronics, electrically pumped of course. Toyota quality + mature hybrid technology + fewer moving parts = exceptional reliability. PS: Have they tested a pure electric yet? Hardly ever does the basic engine or transmission of modern cars have fundamental reliability issues in these tests. It’s almost always other/ancillary components. It speaks more about Toyotas in general than the hybrid drive. I don’t think this test says as much about the reliability of Toyota vehicles Hybrid or otherwise as much as it says about the lack of reliability of European cars. FWIW, they test a wide range of cars form many countries. I’m sure they do test a range of vehicles that are available for sale and make up a reasonable percentage of vehicles sold there. As you noted the Corolla is typically quite reliable so have they tested one of those in the past? I would expect the majority of them to make it to 60K w/o issue. That Yaris Hybrid-R is an exciting ultra-high performance street racer, which has nothing in common with their production hybrids. It has a conventional FWD drivetrain to put all that engine power and torque to the road. It’s only got an electric rear drive for all-wheel traction. It’s not at all representative of Toyota’s thinking about hybrid for volume production cars. Electronics are intrinsically capable of much greater reliability than oily moving parts, when engineered and built for high quality. Likewise high-power electric motors and drives, as witnessed in zillions of hours of industrial service. A full hybrid system like Toyota’s and Ford’s simply has fewer moving parts to wear out and fail. I really don’t know why you keep bringing up manual transmissions, Eric, since I know you understand how a full hybrid works. For the rest, ask yourself why internal-combustion-engine (ICE) cars need to have transmissions. After all full electrics and steam cars never had transmissions. It’s because an ICE can’t stop, and its torque is in a narrow band. It needs a range of gear ratios to match the wheels to the only speed range where the engine has enough torque. Electric motors and steam engines have lots of torque from zero right through the full range, so they drive straight to the wheels. Toyota’s hybrid system inventors realized that, with an electric motor on board to provide low-speed torque, there’s no requirement for a transmission to match ICE torque to the road. Plus by adding a second smaller motor-generator, a planetary gearset is all the transmission you need to maximize efficiency of both the ICE and the motor drive at the same time. I’ll retire from the teacher’s desk now, having said about all there is to say on the topic. Until I write up my Prius COAL/CC. Because you keep stating that the eCVT as used in Ford and Toyotas is some mythical perfect beast with no faults or draw backs what so ever. It is not like there aren’t a lot of modern conventional automatic or manual transmissions that can’t last for the life of the car. Fact is a conventional manual transmission can be extremely durable and is relatively cheap to make, at least with a reasonable number of gears. The Yaris Hybrid R does have a MG between it’s engine and transmission, though in this application it is only used for it’s generator function. However many times mfgs show concept cars that do use technology that will eventually make it to their production cars. So it wouldn’t surprise me if we do see Toyota slipping a manual trans Hybrid in the line up though we will almost certainly never see it in the US. EVs do have “transmissions” or a reduction unit as it is often called, sure it may be a single speed reduction but that does not mean it isn’t a transmission that is also full of lubricant. Never said it’s perfect, only that it’s better. Mike, when was the last time you heard of someone with a blown (conventional) Toyota transmission? I’m just saying that well-made machines with fewer moving parts tend to be more reliable, all other things being equal. It is surprising their first zero-defect car was not a conventional Toyota. It’s a hybrid, so maybe that’s a contributing factor, that’s all. 1996. It was in my brand new Tacoma (less than 20K miles). We were on our honeymoon in Maine. Some kind of manufacturing defect led the thing to eat itself up. That’s the only one I have ever heard of, ever. And the Toyota district rep was totally apologetic, got us a new transmission, had it installed at the dealership within one day and we were back on our way. Good point on that M/T hybrid being a street racer and not representative of Toyota’s approach on high volume hybrids. I don’t know why Eric keeps bringing up the M/T. The high MPG of the Prius could not be achieved with an M/T, the CVT is a key part of the system. Switching to a MT would be a trade off, likely decreasing the city type MPG while definitely increasing the hwy MPG. The eCVT is an elegant, excellent solution to the CVT “problem” and part of the reason that a Toyota/Ford Hybrid gets as good as MPG as they do. By the nature of the eCVT to obtain connection between the engine and wheels the range motor/generator must be driven. To drive it the energy must come from somewhere not during acceleration or instances where the battery is above the target SOC it comes from the battery. Once the vehicle is at speed then the energy comes from the traction MG and is fed into the range MG with the associated losses. So it must drain off some of the engines power to operate the transmission over and above any frictional losses which are still present in the eCVT. A planetary transmission is less efficient than a spur gear transmission. At each gear to gear interface there are losses due to friction. With a simple spur gear OD transmission there would be 2 gear to gear interfaces. With a 3 planet style planetary trans there are 3 times as many interfaces, each of the planets has two interfaces on with the sun gear and one with the ring gear. This of course by spreading the load over more interfaces makes the planetary stronger if the gears in each is made from the same material. A great example of the facts are demonstrated by looking at the MPG numbers of the last Camry with a manual trans the 2011 and comparing it to the same year Hybrid version. MT 22c 33h, Hybrid 31c 35h. So you have a 40% increase in city MPG while the Hwy increase is only 6%. However the Hybrid version uses an Atkinson cycle engine. Using the thermal efficiency of the Prius Atkinson cycle engine 37~38%, and assuming they have achieved a similar efficiency with the Camry engine, and comparing that to the a general efficiency of an engine operating on the Otto cycle which is 25-30%. So the Atkinson has at least 23% better thermal efficiency than the best Otto cycle. So comparing the 2011 Camrys the Hybrid should do better than a 6% increase in hwy MPG w/o even including the gains due to the Hybrid system that provides assistance when climbing grades and then recaptures a part of it while descending grades. Of course the majority of driving done by the majority of drivers is City type driving and the majority of those looking to buy appliance type cars overwhelming prefer an automatic trans so the eCVT is a great solution. For the record there is a vehicle with an eCVT in my driveway, so I’m not anti eCVT I just recognize the engineering trade offs and made my choice based on what was best overall for the particular use the vehicle will see the majority of the time. However in this conversation the question was of reliability and durability and the fact is that a manual trans is the most reliable, durable option that also happens to transmit power with lower losses. Here is another great example that shows the effeciency that the Atkinson cycle engine contributes to the MPG of a Hybrid that has nothing to do with a CVT. The Infinity M series in conventional guise it is the M37 with a conventional torque converter 7 sp automatic with EPA ratings of 18c 26h. The Hybrid version the M35h also uses the same basic conventional 7sp automatic, but replaces the torque converter with a computer controlled dry clutch and motor generator then adds a wet clutch on the transmission output its EPA ratings are 27c 32h. So a 50% increase in city MPG and a 23% increase in hwy, which so happens to be that worst case efficiency difference between the Prius’ Atkinson Cycle engine and an Otto cycle engine. Yes some of that increase is likely due to the lower displacement and some is due to the fact that thanks to that clutch between the engine and motor/transmission allows the engine to be stopped at any speed unlike many eCVT equipped Hybrids where there is a max speed where the engine can be stopped to prevent over speeding of the range motor/generator. Note there are situations where the non-plugin Toyota and Ford Hybrids will shut off fuel to the engine and it will spin, mainly to provide engine braking, but occasionally if the Battery SOC is high enough and the power needs low enough it can be propelled purely by the motor but operation in that mode is pretty limited since turning the engine creates a lot of drag. Eric, clearly you don’t know a thing about the Power Split Device, the “thing” you and Toyota Marketing calls E-CVT. I strongly advise you to study the matter before stating such bold claims as “The Toyota eCVT is much more complex, and expensive than a good old traditional manual transmission”. Pure nonsense, and absolutely not true. There is not one single gearbox, manual or auto, that has less moving parts and less losses than the Hybrid Synergy Drive transmission. Period. All the complexity of the HSD transmission is managed by software, not hardware. The hardware is nothing more than a minimal planetary transmission. That’s the beauty of the HSD transmission. That’s the reason it has won so much accolades and prizes over the years. You coming here and saying the opposite is simply tragic, if not hilarious, for someone who is so bold on his posts. Sorry Eric, but on the very same first post I see yet another proof that you now nothing about the Toyota Hybrids, and you keep on bashing them for nothing. I’m not going to debate all of your posts as I now see you have plenty of them, and if your first post serves as a sample, I would be here all day refuting your baseless claims, and I can’t, I have work to do. Here’s your second wrong assumption: You assume the reliability of the new electrical water pump is the same as the original one (why on earth?!?) and therefore you assume it will fail by around the same time (why on earth again!?!?). 2) You fail to mention, as a consequence of not knowing a thing about what your talking about (Toyota Hybrids) that while the original pump was forced to run whenever the engine ran (normal in conventional vehicles) the new water pump works ONLY when required, and has a VARIABLE FLOW rate. This is one major feature that contributes to a far batter engine temperature management, allows the engine to warm up quite faster, etc, so many things and consequences that I won’t spend too much time here explaining. The bottom line is that the engine water pump operates for FAR LESS TIME, and with FAR LESS EFFORT, than the original pump. So you add 1) plus 2) and you get a water pump that in most cases will outlast the car. Study your subjects before stating nonsense, it will save you a lot of aggravation. I don’t see how a car that has two motors could have fewer moving parts. I would say that it comes down to the quality of the parts, engineering and management of the assembly process, more so than the number of parts. Consistency could also play a role. The fewer variations that there are, the better. With a hybrid car, you typically get one choice of engine and transmission. That lack of variation among cars should provide fewer opportuntities to screw up and raise the odds of finding mistakes before they get baked into the product. Simple the motors each have a rotor as the only part that moves (along with their respective bearings, and it has a single planetary gear set. The range of that planetary is controlled by being directly connected to one of those motor generators. Conventional automatics have multiple planetary gear sets and all sorts of servos, clutches and bands to engage or stop the various elements of those gear sets along with a pump to generate the hydraulic pressure, and solenoids and governors to allow that hydraulic pressure to operate those items. The eCVT even has far fewer moving parts than a conventional manual trans in a common 5sp configuration. The eCVT is a truly simple elegant transmission. Many cars imported used into NZ from Japan have never had the bonnet opened since they left the factory, nothing goes wrong, why disturb it? How do you know? They don’t get their oil and filters changed? I thought Japanese car owners were pretty persnickety about servicing their cars. No, sadly. The owners know that they have only a limited life before they disappear on a ship, and they often have had pretty much zero maintenance. And since the last tsunami, you have to look out for a tide-mark as well. I can see how some JDM imports could suffer from “Leased Car No Maintenance Syndrome”. slow clap, and threw up in my mouth a little…Pretty small sample size isn’t it? Mostly posting to get all of the, sure to be interesting, posts emailed to me. You’re right on the sample size. Nevertheless, in decades of testing, this was the first one. Pure coincidence? Well, the Corolla does do pretty well in reliability rankings just about anywhere you look. So just maybe it did just possibly earn it? I guess this is an international website. I’m just underwhelmed because they can only test vehicles that are available to them, and in this case, it isn’t even a vehicle that is available in the US. Is this test really that much different than what every car magazine out there runs? I know there have been some magazines that have had Chrysler products be absolutely flawless for their 40K test, yet have had oil eating suspension breaking Porsches also. I look at a test like this as very meh… What part of this am I supposed to be impressed by? Have any of the cars tested by American magazines over a similar distance done as well? Zero issues, even of the smallest, niggling kind? I don’t have that information readily available. If you do, I’d be glad to share it. Motor Trend’s Dodge Challenger R/T has zero failures/defects/repairs during its time as a long term test car. @Philhawk – If you mean the 2009 that they had, their test was for 30k miles, I’m not dogging the Challenger, mind you, or any Chrysler product, just pointing out that 30k miles is less of a distance than 60k miles. You are correct sir. I don’t know of any US publication that does the 60K mile test. I want to say Car and Driver did a 100K test on a Hyundai Genesis sedan. I can’t remember what if anything failed though. , I just replaced the first and only failed part on my wife’s W-body. It needed a side marker light bulb. That has been it so far, and it has 90K miles on it. So…yes it is only one car out of millions made, but I think you get my point. Back in the ’70’s, I recall some car mag, possibly Road Test, doing a 50,000mi “teardown” of a Ford Pinto, with possibly the 2.0L engine. Anyone have similar recollections? I don’t remember any egregious findings. CR had high marks for the Ford Fusion Hybrid’s reliability, which seems incredible to me. Perhaps Ford uses the same suppliers as Toyota for its major subsystems? A car is only as reliable as its parts. I believe that it was Road Test. The Pinto held up well. I don’t recall there being any real problem with the Pinto’s engines. Ford, unlike GM with the Vega, intentionally used tried-and-true components with the Pinto. The Pinto’s problems were more likely to be rooted in the lax quality control standards used by all of the domestics (and the Europeans) at that time. A tear down is hardly the same thing. These cars today in these tests are driven as if a normal user were using it. Engines and transmissions stopped breaking (mostly) quite a while ago. But what about all the other myriad of small (and not so small) issues that crop up over an extended period of miles and time? We’re talking about anything and everything that could be noted to be an aberration of any kind from the as-delivered brand-new status. The Ford Fusion Hybrid’s eCVT is made, to Ford design parameters, by Aisin, a subsidiary of Toyota. However the rest of it is pure Ford either made by Ford or other suppliers and many of those items are covered under Ford patents. Note only the 2010-12 Fusion Hybrid and Escape Hybrid use an eCVT produced in Japan at an Aisin plant. The 2013 Fusion Hybrid and CMax do not use an Aisin eCVT, they are produced in the US at Ford’s VanDyke transmission plant. The Aisin plant is actually a joint venture between Aisin and Borg Warner. My understanding is that Ford independently developed their full hybrid system, and licensed Toyota’s patents when they issued. (That by the way is how patents are supposed to work.) Ford buys more than just hybrid components from Aisin, don’t they? It’s a shame we don’t get this model in North America, given the underwhelming reviews of the Yaris-based Prius C especially in the ‘comfort/highway driving’ categories. I’d imagine the Auris does better in that area. 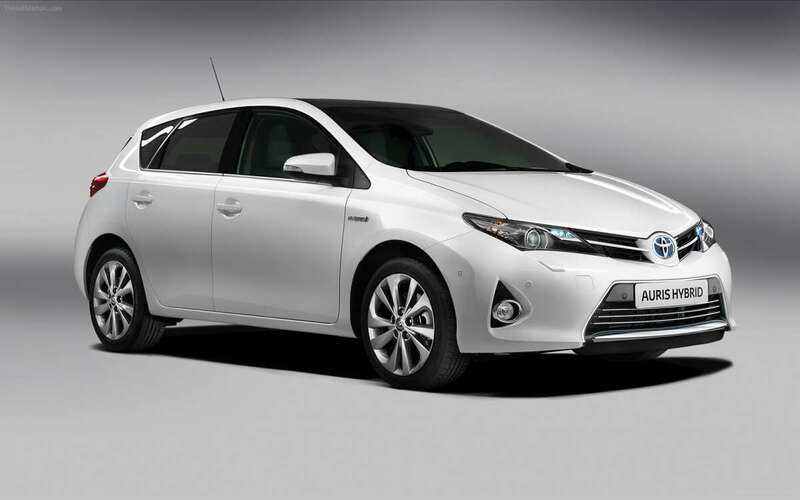 Here’s a link to Toyota UK, showing their hybrid range. Keep in mind that the prices include 20% VAT. That Prius+ looks like the Prius V sold in N.A., but the latter doesn’t have a 3rd seat available. Bummer! It is the same. I’d guess they don’t have the 3rd row seat to avoid criticism of it being too small? A work colleague has the new Auris (Corolla) non-hybrid with the 1.8 and CVT, they finally replaced the old 4sp auto. He doesn’t like the driving characteristics because it is slow off the line, even if you ‘stall it up’ – no doubt to protect the transmission, improve fuel economy or even emissions! Also thanks to Toyota’s attempt to be ‘cool’ with lowered seating position and roofline, the height of the rear window that is transparent (not blacked-out) is about half as high as the previous model. I found the Camry hybrid I drove to be the same, due to taking off under electric power only until the engine started up. You could however hold it on the brake and induce the engine to start which improved things if you wanted a quick/responsive getaway, such as crossing a gap in traffic. Here’s a recent list of most reliable brands in the UK, published by WhatCar? The findings are based upon aftermarket warranty claims. You’ll notice that the Japanese brands do well, while VW is in the lower half. It’s odd how Europeans swear by the reliability of their VW’s, despite the lack of data to support that position. My ’10 Civic LX’s very firm suspension would probably rattle some arthritic bones, so Clarkson’s demographic opinion about Honda, if accurate, is puzzling unless they’re softened-up for the UK market. And young punters here tend to trick up Hondas (particularly old “breadvan” Civics) more often than Toyotas, so I do agree that Toyota fits the elderly stereotype better, which is why they introduced the Scion brand, targeting younger buyers. An irony, that Chevy ranks much higher than Vauxhall, a sister brand, whereas Ford & Mazda are adjacent despite being a bit more separated, corporately speaking. This survey is of 3-8 year old vehicles so when the bulk of those vehicles were built Mazda was still closely tied to Ford as Ford had controlling interest at that time. The Chevy’s in the UK are Korean, while the Vauxhalls are European. Perhaps Daewoo has (or had) better engineers on the payroll than Opel. Better QA or Mfg engineers, anyway. I suspected that the models’ respective origins might explain the difference, but didn’t know for sure. Anyhow, I never had the impression that W. E. Deming’s quality philosophy got much traction in Europe; anyone know otherwise? The man was practically a national hero in Japan. As some correctly observe, not everyone gets a lemon from low-rated makes. The difference is sample variance, like the old saw about cars built on Mondays. To be fair, I’m not sure that Daewoo embraced lean production with any more zeal than did the Germans. Everyone use lean techniques these days, but not everyone is equally good at them. It isn’t just a process, but a different mindset, and there are those who won’t accept it. Friend, Clarkson crashed 2 Toyota Corollas trying to drive on NZ roads at our speed limit he marvelled that anywhere we like we can drive like that legally sideways on gravel beyond his capability, as it turned out, he couldn’t stay with a truck on highway 5 so I wouldnt take his driving tips too seriously he can make cars go sideways on flat tarmac any fool can do that but add 4 inch corrugations to it and a layer of loose gravel and the man has no ability whatsoever he has no spacial awarenes and is simply a poor driver. This list looks very much like such tests here in the U.S., accounting for differences in what cars are available here. While the results of satisfaction surveys can vary quite a bit from place to place, reliabilty surveys seem to be a lot more consistent across borders. JD Power recently released its initial quality survey from Japan, and the results aren’t that far apart from the results of American surveys: https://pictures.dealer.com/j/jdpower/0168/94d060c87d88c35e0aea16b32eec47f5x.jpg Lexus, Toyota and Honda at the top, MINI at the bottom, Mazda below average. I wouldn’t put too much stock in that survey as it represents aftermarket warranty claims. For it to tell the whole story we would need to know the percentage of the vehicles from a given mfg that are covered by an aftermarket warranty as well as the relative number of vehicles sold. They may cover that last component the article doesn’t say however. So if it is by the raw numbers then yes I would expect that Honda and Toyota would rate high since they have a relatively small market share in Europe than say VW. I gather from your comments on this website than you’re not inclined to accept any survey that casts a favorable light on Japanese cars. No just pointing out the fact that the survey you posted leaves out a lot of the facts. Spending over 25 years as a mechanic working on all sorts of cars and trucks I’ve seen the reality of Japanese “reliability” and the true cost of ownership associated with them. You’ve proven my point for me, namely that I gather from your comments on this website than you’re not inclined to accept any survey that casts a favorable light on Japanese cars. No I’m not inclined to accept a survey that doesn’t reflect reality. 25 years of anecdotal experience, which means you have knowledge of one sort, but not the kind that reflects consistent global experience. Have you not noticed that there is a remarkable consistency in numerous surveys form many sources originating in many countries? For decades now?Yet somehow that overwhelming evidence is to be tossed out from your experience working on a finite set of cars. Since you live in Washington, wouldn’t the percentage of cars that came to your shop be intrinsically more Japanese? Maybe not, but as much as I respect your technical skills, your determined effort to discount overwhelming data and evidence is just not convincing. According to you, none of the surveys reflect reality. Everyone else gets it wrong, every time. Except for you, of course. There seems to be a problem there, and it isn’t with the surveys. I agree, it is a very very vague survey. There might have only been 2 range rovers as part of the survey, and one of them might have blown up its air suspension, while there were 100K Civics and only a few of them blew up their struts.. If you actually read the survey, you’ll see that isn’t possible. The average for a given model is 100, and the minimum is 50. While the margin for error for that isn’t low, it’s not lacking usefulness, either. The individual rankings shouldn’t count for much, but one should be able to generalize about differences between the best and the worst performers. @ Paul, yes I live in Washington and we do have a lot of Japanese vehicles, certainly more than say the Midwest but less than CA. One of the reasons I don’t put too much stock in some of the surveys is their methodology is often a little suspect. For example Consumer Reports only takes surveys from the original owner, they also ask you to check a box if you feel there was a problem in that particular area. For years when virtually all Toyota and Honda vehicles used timing belts the standard was to replace not only the timing belt at that service but to also replace the cam and crank seals, valve cover gasket, water pump, idler and tensioner pulleys, and thermostat. So if you are replacing those items as frequently as every 60K it is much less likely to have an owner report that they have every had a problem in those areas. On the other hand someone who has a water pump fail due to age will report it as something they consider a problem. I’ve also had people bring Honda too me who were told by the dealer that replacing their axles is “normal” 100K maintenance. Or how about those people with Hondas who were told the reason their ignitor failed was because the were a few hundred miles late doing their scheduled service. Then there are all those Toyota engines where the dealer blamed the owner for the “sludge” due to a lack of service and not due to the engine design, despite the fact that many of those customers had their vehicles only serviced by Toyota dealers and at the intervals the dealer recommended. Then after settling the law suit they announced how they have redesigned their engines to “lessen the likelihood of sludge formation” not that there was a flaw in the old engines we just did it to ensure the best service to our customer? The fact is that Toyota and Honda do a much better job of protecting their reputation and blaming problems on owners than many other mfgs. A great example are the Toyota trucks with the frame rust problem that they bought back at 150% of KBB retail value to keep owners happy and their mouths shut. Apparently, you believe that this is a “fact” because you claim that it is. Forgive me, but I don’t see any evidence to support your position, nor have you established your credentials as an expert witness. From here, it more closely resembles speculation mixed with heavy doses of wishful thinking. I went to the link and found nothing that explains this. Kind of difficult to understand how the survey was done when nothing was provided. OK now I’ll accept as a much better indicator than based on the first article you pointed to which gave zero information on how they computed those statistics. However that score is still a little skewed away from pure reliability since the cost of repairs and the average number of days it spends off the road due to repairs also factor into their score. Certainly the cost of repairs is important to them or anyone footing the bill and how many days you are w/o a car due to repairs is also relevant. However that cost factor will skew the results to favor cheaper cars and could be part of the reason that the high dollar cars tend to be at the lower end of the scale. Whoopdeedoo… I still wouldn’t be caught dead driving that dreadfully boring appliance. I’d much rather drive a somewhat flawed car with personality. But that’s just me. Lies, damned lies and statistics. That’s why I never pay any attention to Reliability-Or-Whatever tests. Regardless where they come from or who publishes them. I really kicked the hell out of a 1982 845 cc Renault 5 for years in a row and it had zero mechanical issues. Ditto behavior for my younger brother with his first car, a 1978 Fiat 127 with a 1,050 cc little screamer: ditto zero mechanical issues for years in a row. If we had believed all the prejudices and “tests” about Southern European cars we should have never bought those cars in the first place. For the most of us owning and driving a particular car is all about emotion, that’s why we enjoy this website. Otherwise we all better switch to a Trabant with a 1.0 ltr. 3 cyilinder Daihatsu (Toyota) engine swapped in. Because essentially that’s all you need for transportation. That’s the damned thing about it all, we drive cars one at a time. Each car can come from any part of the reliability curve. Your bulletproof Renault came from a very thin part of the curve. Yep. The fact that the individual has an experience that is necessarily anecdotal is the issue here. Under a traditional mass production model, which was invented by Ford and copied widely, a typical defect rate was about 10%. The Toyota lean system aspired to 0%, and perhaps got it down to about 1% or so. Now apply that to another car. Buy three Fords, Renaults or whatever in a row, and the odds of all three being good are about 73%. On one hand, 73% leaves for a lot of happy people. But on the other hand, some of the 27% are going to be upset, some of them very upset. Many of the 73% simply won’t understand the grievances of the 27%. They’ve had positive experiences, and can’t understand why anyone else could feel otherwise. There’s your math problem right there. Many are pleased, but a significant minority is or has the potential to be disgruntled. Meanwhile, at automaker HQ, pride kicks in. The maker of the car will probably listen to the majority while dismissing the complaints of the minority, failing to recognize that the experience of the minority reflects what necessarily happens when the odds catch up to some people. As a result, nothing changes, and some of the minority abandon the brand when given a better alternative. The fanboys who remain assume that the disgruntled people must be “bigots” who don’t appreciate good cars. Market share slides until eventually, it’s time for bankruptcy court. Well put. The trouble with maintaining Toyota-level QC is, positive results don’t show up immediately because of distracting intangibles like marketing, economic swings, labor & supplier issues, commodity prices, & the like. It must take extreme management discipline & long-term thinking, from the chairman on down, to get to that level & stay there, year after year. Another point of confusion: CR surveys find that some statistically unreliable or high cost-of-ownership models still get high satisfaction ratings, like certain sports cars. One of the problems that Americans have had with lean has been the top-heavy style of management. If managment is convinced that labor is the enemy, then it’s harder to make such a system work. American manufacturers tend to get the unions that they deserve. My Renault 5: check, good car. My brother’s Fiat 127: check, good car. My parent’s car in the seventies, a Simca 1100: check, good car. Our neigbor’s Renault 4: check, good car. That’s 2 random families with 4 good Southern European tin cans. Well, that’s a 200% score on the Reliability-O-Meter !! Must be doing something wrong here…. The point of this post was not to so much praise the Auris, but note that any car had finally aced this test. It reflects that cars are getting more reliable in every way, as other cars have also come very close. That’s the real message to take home here. It wouldn’t have surprised me if another car had aced this first, but I find it to be somewhat fitting since the Corolla is the posterboy of Toyota’s long term efforts to improve reliability, and is its biggest seller globally. It may have come down to luck or coincidence, but there it is, nevertheless. Agreed. I’m surprised a conventionally-powered Toyota didn’t take this already. It’s simply amazing how cars have changed. One possible explanation: The revolution in numerically-controlled tools & automated diagnostic & test equipment. I recommend the cable shows “How It’s Made” & “Ultimate Factories” to get an idea of how far manufacturing technology has advanced since the days of Henry Ford & Alfred Sloan. Interestingly, not all handwork has been eliminated, but it’s used only where necessary. maybe the web page needs to be changed to “Curbside Classic Toyotas, past and future”.